Rumors of new iPhone capabilities are coming hot and heavy, and we're still two months away from the device's rumored release window. As we reported, the pre-release iPhone 3.0 software includes a reference to a Broadcom communications chip, the BCM4329, which supports 802.11n WiFi, FM reception and transmission, and the beefier Bluetooth 2.1+EDR protocol, which includes Near Field Communication (NFC) auto-paring. Now comes word that a slew of video-editing interface elements are hidden inside the iPhone Software 3.0 beta release. Austrian übergeek Ben Miller discovered the .png files when digging around inside the beta. 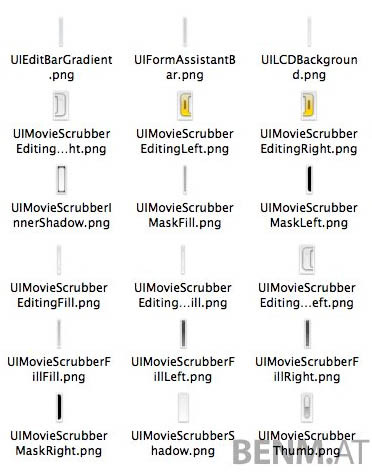 With names such as UIMovieScrubberEditingLeft.png, the files do indeed seem to indicate that a video-editing app may appear in the next iPhone - if, we hasten to add, the reported .png files are legit. Apple hasn't made any mention of video capability in its upcoming iPhone refresh - let alone in-phone video editing. However, we reckon - with some evidence - that such capability is, indeed, on its way to an iPhone near you (although of what quality, we'll have to wait and see). And remember that Imagination Technologies, designer of the PowerVR MBX hardware that powers the iPhone and iPod Touch, announced a new and potent graphics processor, the PowerVR SGX543, this January. Imagination then followed that with a peek at a multi-core version of the same design, the PowerVR SGX543MP at last month's Multicore Expo in Santa Clara, California.